Introduction: The use of self-expandable metal stents (SEMSs) is effective in the palliative treatment of malignant biliary or duodenal strictures. However, few reports document the concurrent use of biliary and enteric SEMSs, mostly likely secondary to its technical difficulty. Methods and Procedures: We report a case of concurrent use of biliary and enteric SEMSs in treating a patient with inoperable duodenal cancer with obstructive jaundice and gastric outlet obstruction. Results: A 69 year old female was admitted to the hospital with symptoms of gastric outlet obstruction and jaundice. Her workup revealed inoperable adenocarcinoma of the ampulla extending into the third portion of the duodenum. The patient was morbidly obese with severe chronic obstructive pulmonary dysfunction, and a poor candidate for a double bypass operation. Using a side-viewing duodenoscope we were able to place a 6×1 cm SEMS in her common bile duct under fluoroscopic guidance. Subsequently, and using a gastroscope, we were able to transverse the obstructing mass with a guide wire and, under fluoroscopic guidance, two 2.5×9 centimeter enteric SEMSs were successfully placed across the obstructing lesion with a 4 cm overlap (figure). The patient was able to tolerate full liquid diet on post-procedure day number two, and her jaundice resolved completely. She was discharged home on post procedure day number 5. 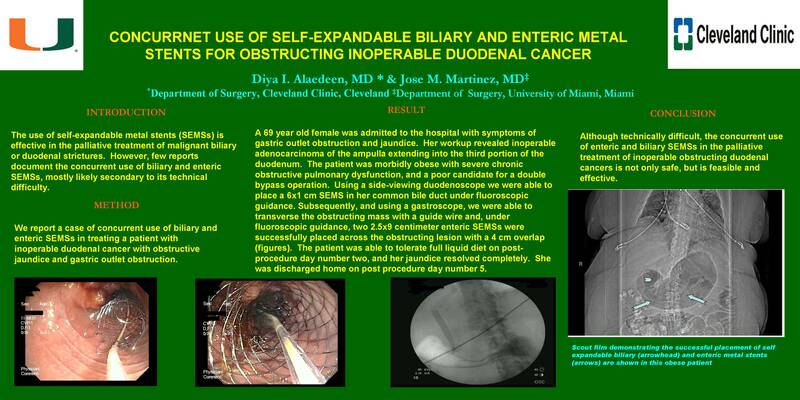 Conclusion: Although technically difficult, the concurrent use of enteric and biliary SEMSs in the palliative treatment of inoperable obstructing duodenal cancers is not only safe, but is feasible and effective.